Scott Klein is a Microsoft SQL Server "Most Valuable Professional" and independent consultant specializing in SQL Server performance and business intelligence. Scott is the author of several books, including Professional SQL Server 2005 XML, Professional LINQ, and Pro ADO.NET 4.0 Entity Framework. 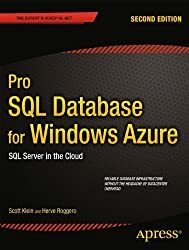 He was a contributing author to Pro SQL Server 2008 Relational Database Design and Implementation, as well as to the Microsoft SQL Server 2008 Bible. Scott has written many articles for the SQL Server Standard magazine. He holds the MCDBA, MCSD, and MCSE certifications. He is heavily involved in the south Florida community, running two SQL Server user groups and the South Florida SQL Saturday events. Scott also speaks frequently at user groups across south Florida. Scott has nearly 20 years working with SQL Server and consulting in small to enterprise-size environments.